Health Benefits of Papaya - Papaya is a native of Central America and now it is grown in many parts of the world. It is a nature's gift to mankind to treat many health problems. Portuguese traders brought this to India, and now it is commonly seen all over India. It is also known as pawpaw and papaw in some countries. Papaya, a powerhouse of nutrients, is a delicious fruit, which was reputably called as "Fruit of the angels" by Christopher Columbus. The botanical name of papaya is Carica papaya. Papaya is available in spherical and pear shape. The ripe fruit is orange in color. Health benefits of papaya include in the ripen fruit, unripe fruit, seeds, leaves and milk. Papaya is an excellent source of Vitamins C, A, E, K,Folate, Pottasium, magnesium, Dietary fiber, and very low in calories, and therefore has many health benefits. Amino acids like glutamic acid, proline and arginine are present in the papaya seeds. 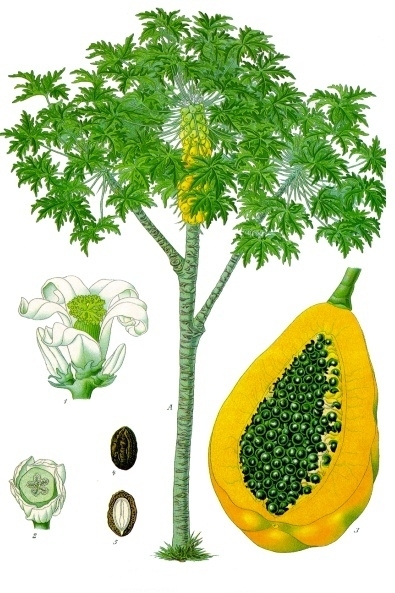 In some of the ayurvedic medicines, papaya is used for treatment. It is considered as an ayurvedic plant. According to Ayurveda, Papaya increases pitta, and balances vata and kapha. Papaya contains papain, a digestive enzyme, which is used for treating sport injuries. The latex extracted from papaya is used in treating boils, warts, burns wounds, and freckles. Helps to build up immunity from cold, flu and infections. Helpful in irregular menstruation and reduces menstrual pain. Papaya decoction helps to get rid of intestinal worms, especially round worms. Papaya powder extraction helps to remove the blockage of urinary tract and allows free flow of urine. Helps in strengthening the liver. Papaya is helpful in treating throat infections. Helps in treating skin problems like psoriasis, rashes etc. For asthmatic attack, inhaling the smoke of papaya leaves is helpful. The antioxidants properties are more in ripe fruits. Papayas can be used as just like fruits. They can also be used in salads. Several delicious recipes can also be made with raw papayas. Ripe fruit can be used for making juice, halwa, pudding, jam etc. When you consider health benefits of papaya, the seeds are also edible with a peppery flavour and medicinal properties. Papaya may cause severe allergic reactions in sensitive people. Those who are susceptible to latex-fruit allergy syndrome, should avoid using papaya. Pregnant women, especially in the early stages, should not consume papaya to safeguard from abortion. Papaya may induce abortion. Note: The information on this article are for educational purpose only. Please consult your doctor or health adviser before use.